BIRGUNJ, BIRATNAGAR, JANAKPUR and CHITWAN, June 18: A special team of police on Friday arrested seventeen doctors from Birgunj, Biratnagar, Janakpur and Chitwan allegedly for their fake educational certificates. Among the arrested, nine doctors are from Birgunj, three from Biratnagar, two from Janakpur and three from Chitwan. 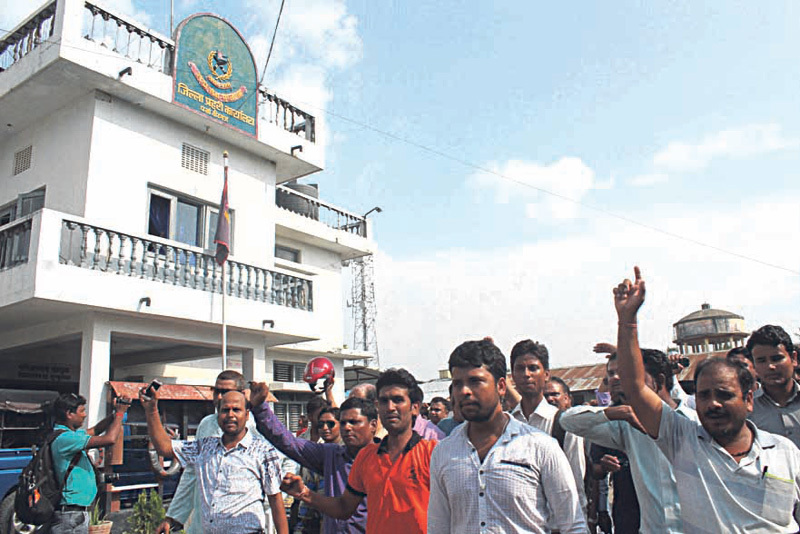 A Central Investigation Bureau (CIB) team of Nepal Police arrested nine doctors from different locations of Birgunj on Friday morning, according to Dr Pramod Kumar Sarraf, vice-president at Medical Association, Narayani. Kushraj Giri, Saroj Singh, Pannalal Patel, Arun Kumar Gupta, Dinesh Sah, Rahullah, Irshad, Nimesh Raman Pal, and an unnamed doctor, are among the nine doctors arrested from Birgunj. Monika Singh, wife of arrested Dr Saroj Singh, condemned the “arbitrary” arrest of her husband. According to her, police have not given any reason for the arrest and no arrest warrant was given. Following the arrests, doctors have shut down the Outpatients Department (OPD) services in different hospitals including the Narayani Sub-Regional Hospital, and National Medical College Teaching Hospital, Birgunj. They have threatened to continue the shutdown of OPD services until they are informed about the reasons for the arrests. In Biratnagar, police arrested three renowned doctors on the charge of possessing fake academic certificates. Senior physician Javed Akhtar Ansari, child specialist Dr Sanjay Das and orthopedic surgeon Dr Abul Kalam are those arrested. Dr Sanjay Das was arrested from his clinic while Dr Javed from Trauma General Hospital. Dr Abul was arrested from Lifeguard Hospital in the city. Dr Kailesh Kumar Shrestha, the managing director at Life Guard Hospital, said that the CIB’s manner in which the arrests were made is illegal. “Dr Javed was attending to his patients. Two persons entered his cabin as patients and took him along with them. He was arrested in an abduction fashion,” he said. Similarly, dentist Dr Ravi Pandey and gynecologist Dr Ramji were arrested from their private clinics in Janakpur, informed SP Ramdatta Joshi, who is also the chief of the District Police Office (DPO), Dhanusha. The other three doctors arrested from Chitwan district have been identified as Dr Rajani Agrawal, Dr Sunil Acharya, and Dr Rajan Puri. They are the employees at Bharatpur-based Teaching Hospital. According to SP Basanta Kunwar, chief of Chitwan DPO, all the three doctors were taken into custody from Bharatpur-based Pragati Polyclinic. All doctors arrested from Biratnagar and Janakpur have already been airlifted to Kathmandu for further investigations while those arrested from Bharatpur are still in Chitwan DPO custody. SP Kunwar said that preparations are being made to airlift them to Kathmandu.